Posted on May 6, 2016 at 5:21 am. City of Dreams, owned by Melco Crown Entertainment, is a spectacular sight in Manila. 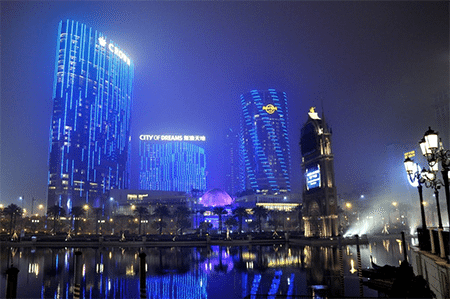 CROWN Resorts has not yet announced what it will do with the close to USD $1 billion it has generated from cutting back its interest in Macau. Crown Resorts boss James Packer stepped down as co-chair of the Melco Crown Entertainment, which is based in Macau, this week. The company also announced it was cutting its stake in the casino operator to 27.4 per cent, from 34.3 per cent for USD $800 million. The casino is expected to use some of the money to reduce its debt pile of $2.8 billion, while it could also be used to fund part of the $2.4 billion worth of projects Crown Resorts has in the pipelines, culminating in the opening of Crown Sydney in 2022. Packer is on record saying Macau is an exceptionally important part of Crown Resorts future, but a crackdown in the last few years on corruption in China has seen a major downturn in the world’s biggest gambling hub. Melco Crown Entertainment operates casinos in both Manila and Macau, with Crown Resorts in partnership with Chinese billionaire Lawrence Ho. The company opened the exclusive Hollywood-themed $3.2 billion Studio City resort which opened with great fanfare in October. Showing just how committed the company was to the Macau region, part of the launch included a short film directed by Martin Scorsese which included an A-list cast. The Audition featured Robert De Niro, Leonardo DiCaprio and Brad Pitt with each rumored to have pocketed USD $13 million for four days work. But 23 months of successive downturns in gambling revenue in Macau has put question marks on the huge outlay the company has made on the investments. On the back of the news about scaling back in Macau, Crown Resorts shares jumped 54 cents, to near $12.50 per share at the close of business on Thursday.